WHERE: Downtown Springfield, Pop-Up Gallery Locations include 1550 Main, New England Public Radio, UMass Springfield and Valley Venture Hub. 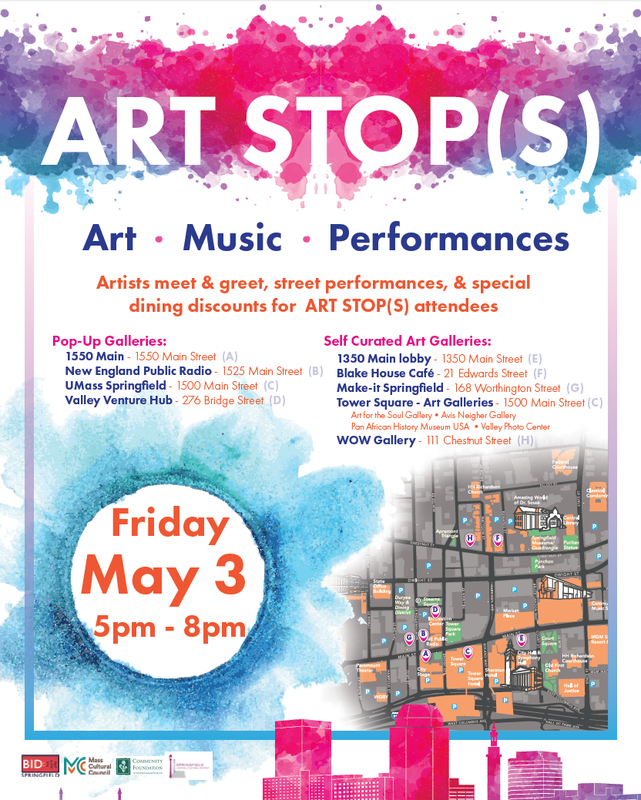 The Springfield Cultural Partnership is bringing Art Stop(s) back to downtown Springfield on Friday, May 3 from 5:00 pm to 8:00 pm. The event is free and open to the public. 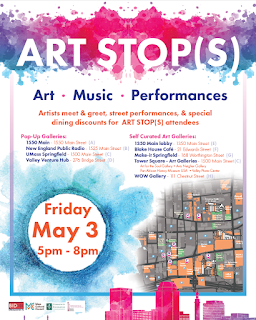 We are pleased to announce the gallery locations, artists, buskers and downtown dining offers for this Art Stop(s) event. The event highlights both the flourishing creative economy within the Springfield area and the walkability of downtown Springfield. This year, existing art galleries will also participate in Art Stop(s) making it the largest Art Stop(s) event yet. Blake House Café at the Springfield Museums will host works of art from their teaching artists. 1350 Main, Make it Springfield, Words of Wisdom Gallery, and the galleries homed within Tower Square: Art for the Soul Gallery, Avis Neigher Gallery, Valley Photo Center and the Pan African History Museum USA will be open and displaying works of art from their current exhibits and collections. Additionally, the newly opened Visitor Information Center will have their retail artists on-site and providing information on other Springfield offerings and events. Artists selected to display their works at the pop-up galleries during Art Stop(s) include Madge Evers, Cathi Burton, Ryan Murray, Jennifer Delgado, Jason Antaya, Briana Serrao and students from Springfield Technical Community College’s Visual & Performing Arts Program. Artists who will be on display at the existing gallery locations include Paul Midura, Kristine Crimmins, Mary Jeanne, John Simpson’s Commonwealth Honor Students Renaissance class works, Tiffany Greene, Keith Sikes, Dr. Seuss Bread wagon restoration, Dane Tilghman, Robert Markey, Maureen Cotti, Tiago Finato, Susan Urban, Steve Hamlin, and Diane Savino. Artists will be on site to discuss their works and offer prints or other works of art available for sale. All pop-up gallery works of art will be on display at their pop-up locations and offered for sale May 3 – July 31. A complete list of artists from all of the participating locations is available at www.SpringfieldCulture.org. Buskers will be activating the streets along the Art Stop(s) walk. Musicians, Puppeteers, Magicians and Performing Artists will provide entertainment for attendees to enjoy as they stroll between galleries. Buskers include Scotty Swan, Sam Blumberg, the Drama Studio, Maya Apfelbaum, Faith Ward, Luna Lucia, Ken Harris, Tom Crean, Ava Simone and Rose & Fred Higgins. Several downtown restaurants will be offering 15% - 20% food orders on the evening of May 3 to any patron that presents their Art Stop(s) Passport. More details on participating restaurants will be available starting in April at www.SpringfieldCulture.org. Art Stop(s) is sponsored by Springfield Cultural Partnership, Community Foundation of Western Mass, Mass Cultural Council and the Springfield Business Improvement District.